Immerse yourself in the crystal-clear waters of Alpine lakes. Whether you spend a whole day swimming and sun-bathing at the lake or just want to take a refreshing dip after an arduous hike or bicycle tour… The deep blue sky and the majestic mountain scenery, the pristine mountain air and the crystal-clear mountain water are sure to make your holiday one to remember forever. The Tannheim Valley lakes are true natural treasures! Make a trip to Lake Haldensee at the entrance of Tannheim Valley. This is where water babies of all ages will find everything they need to cool down on a hot summer day and spend a great time swimming and having fun in the sun. Featuring a 50-metre water slide, boat rental, toddler pool, massage nozzles and a waterfall, this is the lake of your children’s dreams. Relaxation guaranteed for adults, fun and excitement for kids! Residents of Guthof have free admission! How about visiting the gorgeous nature reserve Vilsalpsee! The walk there is suitable even for less experienced hikers and is even manageable for families with prams! Take a swim in one of Tirol’s most beautiful mountain lakes (free of charge) and experience unspoilt natural countryside in Tannheim Valley, which is referred to as ‘Europe’s most beautiful high valley’. Hi there, hikers and nature lovers! Upon arrival, guests of Guthof will receive their summer cable car ticket, completely free of charge. Four cable cars – Wannenjoch, Neunerköpfle, Füssener Jöchle, Krinnenalplift – are included – every day! You can use every cable car once a day (return ticket), and so have a much easier way of exploring Tannheim Valley’s high-altitude mountain trails. The tickets are immediately effective. That means: Off you go to the turnstile, hop on board the cable car and up you go! For family hikes, the summer cable-car ticket is ideal. Having reached the summit comfortably and relaxed, you can use all your energy to explore the high-altitude hiking trails. Look forward to 300 km of hiking routes along with lots of traditional chalets and alpine pastures. Across the street from the Guthof Lutz holiday apartments, you’ll notice the first cable car – the Wannenjochbahn. There’s no faster or more comfortable way to start your mountain adventure. Have you been to the Gamskopf? Or the ‘smugglers’ trail’? We’re sure you’ll love it! Travel free on 4 cable cars in Tannheim Valley. The Tannheim Valley has a wide range of different hiking routes and tours, all of which you’ll never forget. And having the majestic mountain peaks of Tirol and Allgäu on our doorstep, Guthof Lutz offers a vast range of hiking possibilities. 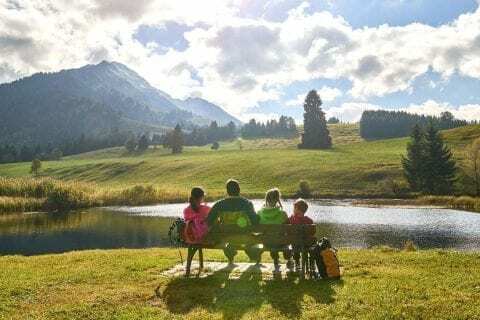 Experience unique hours of hiking in Tirol’s diverse countryside: for example, on the Three-Lake Tour, the themed hiking trail leading around the Neunerköpfle or the smugglers’ path from Wannenjoch to the Iseler in Oberjoch. 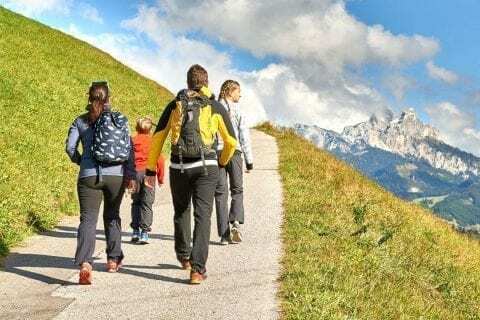 Hiking in Tannheim Valley promises pure enjoyment – and that’s exactly why the region was repeatedly ranked as Austria’s most popular hiking destination! By the way, as our guest, when you arrive you will receive the free summer cable-car ticket free of charge. Four cable cars (Wannenjoch, Neunerköpfle, Füssener Jöchle and Krinnenalplift) are included – every day! The Tannheim Valley is a haven for rock climbers. More and more rock climbing enthusiasts are discovering limestone rock faces as an attractive challenge. The spectacular mountains make the Tannheim region a climbing area you’ll immediately fall in love with. The Aggenstein, the Gehrenspitze and the Gimpel, all of which have gained outstanding reputation among mountaineers, have excellent routes for all abilities. All are located in quiet areas and are facing south. Other gems for lovers of rock climbing are our three demanding fixed rope routes, for example the one on Lachenspitze. The many peaks adorning ‘Europe’s most beautiful high valley’ pose diverse and varied challenges to mountaineers and rock climbers. More about rock climbing in ‘Europe’s most beautiful high valley’, the Tannheim Valley. There’s so much to do! And isn’t it wonderful to feel at one with nature and take so many amazing impressions of your stay at Guthof Lutz back home with you?